Cyclists in the City: 'Cycle routes, we just can't do it, it's not practical' says Addison Lee boss. He's wrong. It's plenty practical. We just need to make a proper start of it. 'Cycle routes, we just can't do it, it's not practical' says Addison Lee boss. He's wrong. It's plenty practical. We just need to make a proper start of it. The young people of Samuel Lithgow Youth Centre were granted exclusive access to AddisonLee earlier this week to interview chairman John Griffin about his inflammatory anti-cyclist comments. You can watch the film they produced above. I listened to John Griffin word-for-word. And it struck me that he genuinely doesn't have any comprehension what a civilised version of London's streets might look like. 'There's just no space' for bike routes, he says. 'It's a congested space out there'. '[Cyclists] just have to protect themselves..they've got to look out for..I could just lose concentration and it's painful for them'. He does make some valid points about training. He even hints that cycling lessons should be part of the driving test (I agree). But his line is this: "Cycle routes, we just can't do it, it's not practical". The thing is, it is practical. Earlier this week, Copenhagen launched its first cycle super highway. The super highway is 17.5km long and "designed to be as direct as possible and have fewer stops and obstructions than traditional bike routes". Look at the London 'cycle super highways' in comparison and weep. Why is Copenhagen building a network of cycle superhighways? The plan is to have 50% of all people travelling to work by bicycle in the greater Copenhagen area by 2015. Why would they want to do that? Presumably for similar reasons to Cambridgeshire county council to 'support economic growth' without the need for yet more and bigger expensive roads, to reduce the costs of congestion and to make the place run more efficiently. People don't need to spend ages looking for a parking space, shops are busy on high streets because they actually are high streets rather than 'corridors' for motor traffic, people can get to jobs more efficently and cheaply than they can by car. Griffin says that people who cycle 'have this thing in their head that everyone's on their case'. No Mr Griffin, that's not the problem. The problem is actually the exact opposite, namely that the people who run London's roads don't have cycling on their case. They are designing it out of London streets. So, instead of designing massively widened pavements and squeezing out cyclists at brand new junctions like Euston Circus (see TfL's insane plans here), they could spend the same amount of money and make sure there is a safe and reliable way for people to cycle through this junction that keeps them as far away from heavy motor vehicles as possible. to just squeeze in with the HGVs and the cars somehow. Or down in Peckham, as Tom Chance's blog puts it, "the council have removed the cycle lane, even though there is ample space, and left the car parking intact. They now expect cyclists to head down a 30mph road without any safe dedicated space." Pictured left is the before and after shot. Tom's pretty blunt about it: "The net effect is that there is less space for cars and buses to overtake cyclists. The council’s reasoning is that cyclists should share the road with cars here, joining the main stream of traffic instead of hugging the kerb. But the road has a 30mph speed limit. Who cycles that fast? Who is confident enough to hold up a white van man on a 30mph road? Almost nobody, that’s who. Every day I see cyclists weaving through traffic jams and putting up with cars hurtling past at 30mph." I think he has a point. Most people don't cycle in London precisely because this sort of road design puts them off. It's designed for cars and treats people on bikes as if they are cars. They're not. What's even more galling is that Griffin thinks that 'cycle route' equals segregated route all the way. It doesn't. It means all sorts of things, depending on the street. He cites Drummond Street as a street that hasn't got room for a bike lane. Drummond Street doesn't need a 'bike lane'. It needs to have less motor traffic or to have that motor traffic slowed down. Do that and the whole streetscape opens up to people on bikes, on foot, on mobility scooters. When Griffin talks about forcing open London's bus lanes for his minicabs, he refers to 'quicker' journeys. He sees the streets as places people need to rush through as quickly as possible. I see the streets as places that need to benefit Londoners the best way possible. That means streets that people can use to travel safely and conveniently on foot, by bike and by car. But let the car roam free, as we're doing in London, and you force all the other forms of streetlife out of the way. As the Mayor of Copenhagen puts it "You cannot dream up more space. You have a certain amount of square metres to divide so they benefit the citizens in the best way possible" Griffin's conclusion is that there isn't any space in London. My conclusion is there's plenty of space. It's about how we make use of it and who we prioritise: his customers or London's citizens? Griffin is being misquoted and misinterpreted all over the place. He must be loving the press and attention that this is getting. You make a valid point that he doesn't talk about a cycle-friendly city, but that misses the point. His objective is clearly to get Taxis removed from bus lanes in London. He knows that he probably won't succeed in getting minicabs in bus lanes, but we could see more areas like the City of London where bus lanes do not permit Taxis ("black cabs") except when actually picking up from the street/dropping off. Everyone seems to have had their two-penny worth about Griffin and his firm, and he must be quietly quite proud of that. He did appear on Channel 4's "secret millionaire" a few years ago I recall, and he actually came across very well. I rather liked the fact he has no time for fat people who he thinks are a drain on the NHS etc.. Either way, there needs to be a complete re-think on roadspace allocation and management if there is to be any genuine attempt to improve the cycling environment in London (and elsewhere) generally. "I rather liked the fact he has no time for fat people who he thinks are a drain on the NHS etc.."
What exactly do you like about it? No different from his misinformed opinion on cyclists really. Good job tarring yourself with the same brush as this unpleasant individual. I hope there was more to it than a dislike of "fat people", but that's certainly all you've said here, which is lazy and needlessly discriminatory. I don't support either Griffin's views or trust the opinion of someone like Kitty, who agrees with him that she too "has no time for fat people". Apparently, his prejudice against cyclists and fat people are part of why Kitty feels Griffin "came across pretty well". For me, they show Griffin to be an arrogant, insensitive and bigotted person, who I'd ignore except that he's a) the owner of a cab firm with 4,000 potentially dangerous vehicles on the streets and b) a big donator to the Tory party, and thus has escaped penalties and criticism for illegally encouraging his drivers to clutter up bus lanes. Kitty: Exactly as I said - why on earth should I have any time who for people who put too much into their mouths? Why should society pick up the cost? He's a monster, but I believe strongly that NO taxis should be allowed in bus lanes - they should be reserved for cycles and buses only. Taxis are more polluting than private cars as they spend half the time driving around empty. Griffin is dissembling about his real objectives. 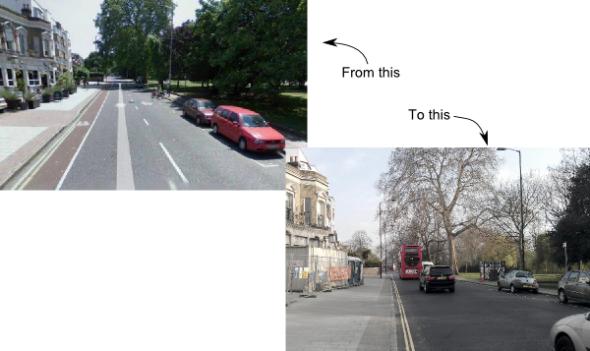 A few days ago Addison Lee Cabs tweeted "Cyclists should be asking why black taxis can use the lanes in the first place. We just want fair competition." I figured that was worth a response "So if the bus lanes were just for buses and cycles and not black cabs you would be happy then ?" Guess what. Addison Lee Cabs have not got back to me. Conclusion: Addison Lee compare themselves with black cabs because Addison Lee covets that road space. Griffin, the master of distraction. Its like a how-not-to guide on getting your way and making out that there has been no fuss about it all along. The objective - get access to bus lanes, the distraction? Us on two wheels.... the sad part of this is his failure of logic - he's damaged his own company and reputation in the process (some say possibly beyond repair in a Ratner-stylee), whilst also showing himself to be rather ignorant of basic road management principles - space CAN be created, but most of all it can be better managed. Germany had the right idea I read a little while ago - they plan to create space by building over a major road. Local people will no longer have fear riding the bike near it, navigating the slip roads, etc. There will be dedicated routes for bikes and even places to walk the dog. Within urban environments roads have to be managed effectively. Heavy traffic rarely exceeds 12mph during congested rush hour in many cities, and a fact of life is that 3 empty seats in a car is wasted space... Griffin could have promoted car sharing at the very least via his firm but instead chose to ramble on like a wolly. It would, after all, benefit the private hire trade to have MORE bicycles used, and on DEDICATED safe routes. This frees up the arterial routes for longer distance cars, deliveries, cabs etc and logistics. It benefits private hire to have MORE bicycles because that also means less parked cars narrowing roads, causing delays from having to wait, aiding visibility. Griffin has entirely missed an opportunity, and if you miss an opportunity in business your business can shut up shop. "Cycle routes, we just can't do it, it's not practical". Oooh, I do love a challenge. The CS routes, it's fair to assume, are going to be developed to a reasonable standard during the next mayoralty (whoever wins). I am rather hopeful that the next mayor could also be persuaded to go somewhat further than this. If all the next mayor could do was think in terms of routes, a circular route, or two, would add considerable value to the Cycle Superhighways, by the simple expedient of joining them all up. I recently conducted a bit of a thought experiment. Firstly I laid down the Cycle Superhighways. Then I joined them up. Then I changed the course of some of the CS routes (because not all of them have been thought through properly). Then I added some essential routes. These routes are, I suggest, the most important - or at least, potentially the most important - in London. I hope actually that some people may disagree with me on this, because to be quite honest with you, I really wouldn't mind debating this. Let us dare to assume that, as a minimum, the CS routes and the two circular routes would be developed to a good standard over the next four years. How much more difficult would things become if we went from 'here' (i.e. thinking in terms of routes) to 'there' (i.e. thinking in terms of a network)? Obviously if we can do this much, then we can do a little bit more, and so on, until the network extends out into the suburbs. Thus I think Mr Griffin is quite wrong to suggest that we can't do cycle routes. Of course we can: we can even do a cycle network. The question is, to what standard can these routes be developed? The biggest problem, it seems to me, is not a lack of space, but how this space is used. "Build it, and they will come." If my whole family cycled rather than just me, we might not have need of a car. We could sell the car. There might be occasions when we needed to be driven somewhere. A cycle friendly minicab company would win custom. The Department for Work and Pension have announced that their contract with Addison Lee not be renewed when it expires on Monday. Gah I see you've been spammed by that s/h-bikeUK bot, too.